For the past three years Cintas has scoured Canadian restaurants and public facilities for its Best Restroom award, but they have not searched out Canada’s Best office space Restroom. You would be surprised how many elegant restrooms that can be found in some office spaces. Telsec Business Centres Inc. has some of the nicest and greenest restrooms in Toronto, but not just compared to other office spaces. A few years ago the office space Toronto restrooms at Telsec underwent a major renovation that not only beautified them, but it also included some green features. The lighting was changed to more efficient fixtures and bulbs, but it was also made softer and more relaxing. 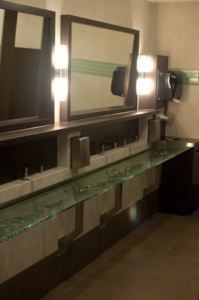 The sinks were replaced with a single glass shelf that stretched the length of the restroom and the entire wall. Over the sink area are two large mirrors that fill most of the wall. The faucets are the true green feature of this restroom. The low-flow faucets are electrically controlled by motion sensors that are self-charging as the water flows past a small turbine inside the faucet itself. While most people do not choose their office space Toronto based on the restrooms or if the restrooms are award winning, many clients have heard compliments about the restrooms from their visitors. One Toronto office space for lease tenant mentioned that they had a customer come visit them a second time, just so they could show off the restroom to their boss. The office space client could not establish a direct corillation between the restrooms and the increased business they have done with that customer, but they said the relaxing feeling could not have hurt it either. There is no big prize for Canada’s Best Restroom, except bragging rights and a little plaque.